ORIGINAL POST: Well, this month has been nothing short of having its share of rumors. We have yet another one now and it seems to hold some validity to it. 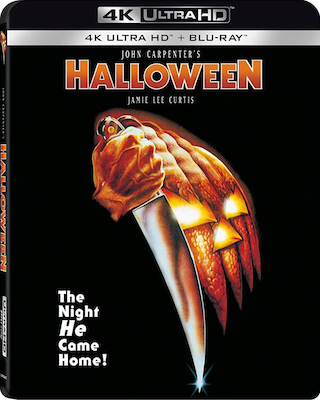 It looks like we should be expecting a 4K UHD Blu-ray release of the original 1978 John Carpenter directed horror classic “Halloween” on September 25th – according to an early alert to retailer Barnes & Noble. The date is actually listed there but no cover art is shown. Also, no other retailers are yet listing the title but this story is currently developing. Credit goes to our friend Shawn Francis (of DVD NEWS FLASH) for discovering this and sharing it on social media. Theoretically Lionsgate would hold the release rights to this and such. It also would definitely make sense that this would come out, considering the film is celebrating its 40th anniversary by getting a new film released later this year – just promoted this past week at Comic-Con. A home video tie-in in terms of marketing the new film could be what spawned this release. Let’s hope they do Carpenter’s film justice and they just aren’t trying to cash in on the anniversary and new film. It’s worth noting that B&N lists that the release will be a “combo pack” with a Blu-ray Disc of the film also included. They also confirm Lionsgate as the distributor.